It ended up being a rainy afternoon here in Spokane so I broke out my yellow rain jacket to keep dry and simultaneously support the Livestrong movement. I finally managed to bring a decent camera along on a day I took my long scenic route home so I got a few fairly good shots. 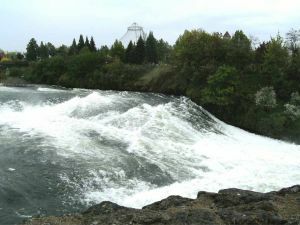 The upper rapids of the Spokane Falls looking back towards Canada Island from the north bank. 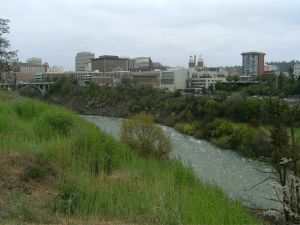 I stopped briefly to take a couple pictures after crossing the suspension bridge that leads to Broadway. 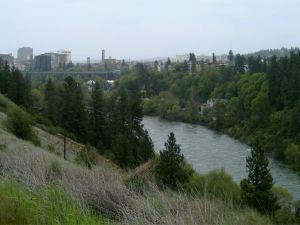 Looking back towards downtown Spokane and the Monroe Street bridge from Ohio St. 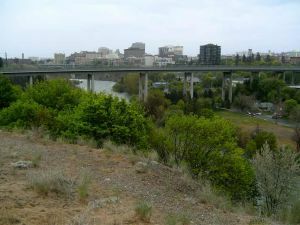 The Maple Street bridge and downtown Spokane as viewed from Ohio St. 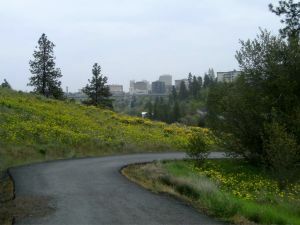 Looking down towards Peaceful Valley and the Spokane River. I love how densely the foliage covers the south bank with the occasional house or condo poking through. It’s also especially picturesque when the leaves turn during the Fall. 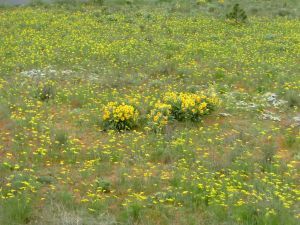 Yesterday John Speare mentioned encountering the beautiful yellow flowers that are covering the bluff area of the South Hill. Turns out they continue on this side of the river as well. Another shot of all the amazing yellow flowers. Seems especially appropriate in light of Tuesday’s emphasis on promoting Lance Armstrong’s Livestrong movement. And a great example of the kind of thing you miss out on when you only travel by car. 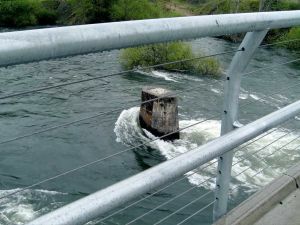 Halfway across the Sandifur bridge. Things were looking pretty shiny thanks to the afternoon rain. 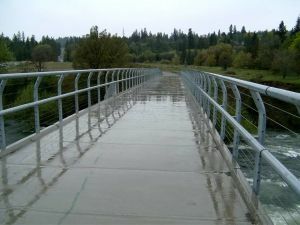 A final shot from the Sandifur Bridge before I leave the scenic part of my route behind to start the climb back up the South Hill.